A Somali militia commander in the capital, Mogadishu, has told the BBC he is on the run after the government launched an operation to disarm him. Ahmed Dai runs a powerful militia in the city, often providing protection to visiting foreigners. A raid on his house near the airport was launched at dawn - killing at least 10 people living nearby. Correspondents say it was the heaviest fighting in the city since Islamist militants were driven out in 2011. Government forces say they took over the house of Ahmed Dai after a battle that lasted more than five hours in a residential area. Several of Mr Dai's fighters were arrested and their weapons seized, but the warlord managed to escape. His militia men have been operating in the neighbourhood near the heavily defended airport zone. After his escape, Mr Dai told the BBC Somali Service that the government had not told him about the disarmament process. But he defended his right to have weapons for "self-defence purposes", because he said he needed to protect himself from Islamist al-Shabab militants. He said that the African Union (AU) force was providing protection for government and foreign agencies, but not for other civilians. 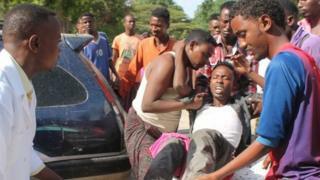 The militants often stage suicide attacks and assassinations in Mogadishu since withdrawing three years ago. Rage Hassan, from the BBC Somali Service, says the government disarmament campaign was launched last week, and officials say 500 guns and many boxes of ammunitions have been seized so far. Estimates suggest there are more than 500,000 guns in Somalia, which has been largely lawless for the last 24 years, he says. Clan-based warlords, rival politicians and Islamist militants have battled for control since the fall of long-serving ruler Siad Barre in 1991. A UN-backed government was installed in 2012, and is trying to win back territory occupied by the al-Qaeda-affiliated al-Shabab insurgents - and bring back a measure of stability to the country.